Digital investment platforms are making a big marketing push in the run-up to the ISA deadline. Competition in digital investments has become more intense in recent years with new providers offering digital solutions, low fees and basic products, making investments more accessible to consumers. Incumbents – both banks and investment specialists – have been quick to respond with their own digital propositions to widen customer targeting. Historically low interest rates coupled with rising inflation rates means that savers are typically losing money in real terms. The best rates on easy-access cash ISAs are around 1.2% AER and longer term fixed-rate accounts offer around 2% AER when fixed for five years. In the face of inflation at 3%, a potentially more lucrative alternative is a Stocks and Shares ISA. The looming ISA deadline, coupled with the influx of new market providers, means that there is more competition for customers. Oscar Williams-Grut at Business Insider noted, ‘I counted no fewer than four adverts for online investment platforms during my morning commute in London this week, while adverts for similar services have been popping up on Instagram and Facebook’. Investment providers are targeting both existing and new investors. For novice investors, a Stocks and Shares ISA can be an attractive option given the complexities and considerations associated with investments: term of investment, risk appetite and existing capital. Moreover, these new investors need to choose the type of provider and platform that they want – if they decide to invest at all. New providers offer simple but effective investment solutions. To attract the novice investor or simply to make investing easier, digital challengers have stripped down their investment products allowing customers to decide their own risk appetite. Offering low fees and simple user journeys that are completely digital, most challengers don’t even require new customers to make an initial investment. These new entrants are effectively making investments available to a wider audience. Nutmeg, one of the first digital investment platforms in the UK, announced in November 2017 that it had 48,700 customers and that its assets had reached £1bn – a 100% year-on-year increase. The provider is one of the few with a minimum investment amount, £500. 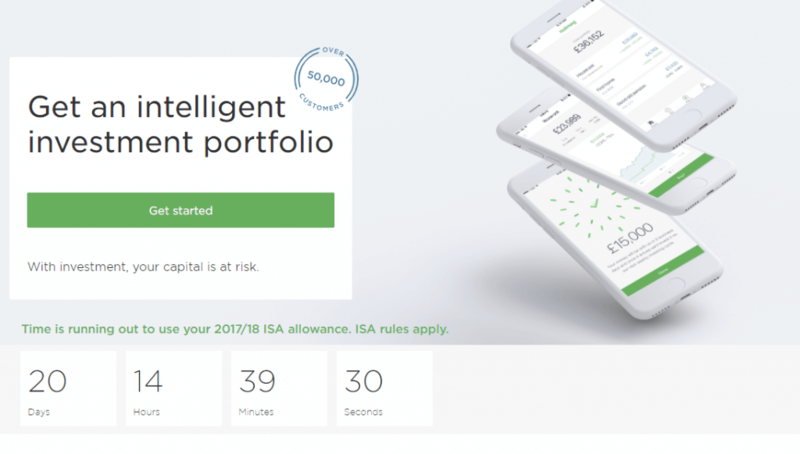 Like some of its peers, Nutmeg has added an ISA countdown clock to its homepage to highlight the deadline to website visitors – nudging users to act. It is also promoting a Youtube video, titled ‘Countdown to tax year-end’, where its Head of Financial Advice, Lisa Caplan, gives an overview of the tax exemptions and allowances available. But, possibly its most interesting move is a collaboration with British Airways. The initiative gives new Nutmeg customers up to 80,000 Avios points (Airmiles), 1 Avios point for every £1 invested, incentivising smaller investors to increase their assets under management with the platform. 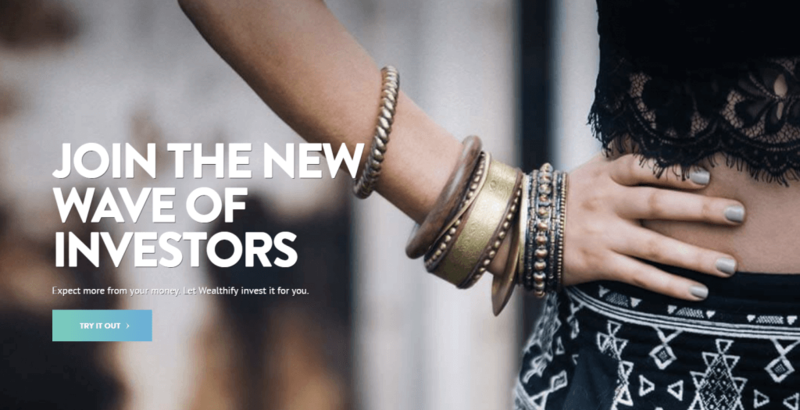 Newer challenger Wealthify says that investments should be ‘easily accessible and affordable to everyone’, promising ‘effortless investing’ without jargon or daunting fees. After only being in business for three years, Wealthify sold a majority stake in its business to Aviva, introducing it to the insurance provider’s 33 million customer base. The response from incumbents has been to bring out their own digital investment solutions that also cater for novice investors. 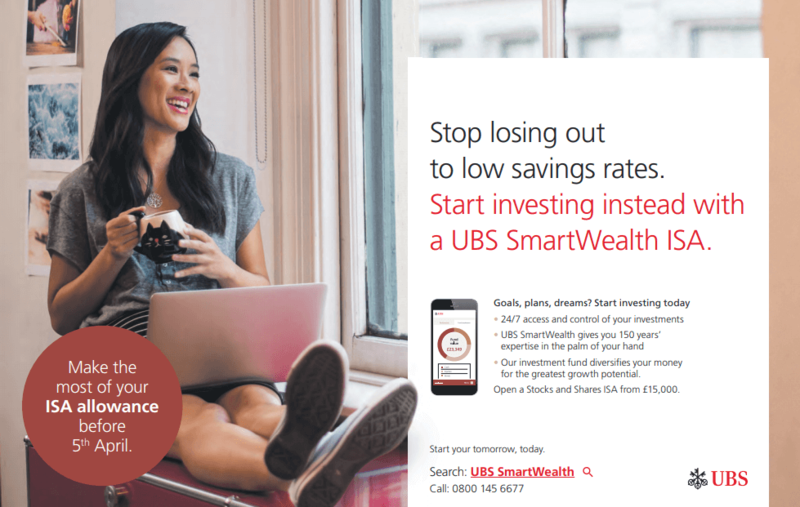 UBS is making a real push for its platform in the run-up to the ISA deadline, encouraging engagement on mobile, highlighting its heritage and expertise and making investments a more advantageous alternative to savings. Barclays launched its Smart Investor platform, first exclusively to its own stockbroking customers in August 2017 and recently also to non-Barclays customers. The platform and its features were created to make it more accessible to new investors but received backlash from more sophisticated stockbroking customers, having lost some of the features that they previously had. With experienced investors making up the clear majority of their existing customer base, investment specialists have been more cautious in their approach. Fidelity has had its eye on novice investors since 2013 when it launched its Pathfinder tool. At the time, the public site feature allowed users to choose from a range of 15 diversified funds each of which included up to five different asset classes – cash, bonds, shares, property and commodity. Today’s tool has been simplified; it has 10 funds, 2 for each risk category. While the investment specialist shows an interest in new investors, adding a mobile application journey could support this further. 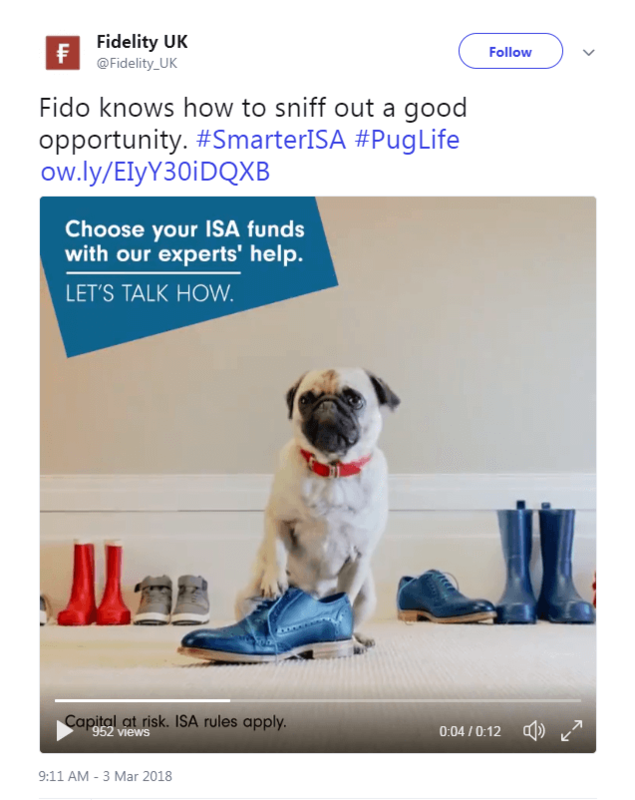 In its competition for ISA customers, Fidelity is using a pug to connect with the everyday consumer and reassure with the availability of advisory support. Hargreaves Lansdown, one of the more established UK investment specialists, is also widening its target customer base. The provider recently launched a new look to reflect how the brand is evolving. Its apps and website have been made ‘simpler, faster and more accessible’, using large font to make reading easier and bold colours to represent its energy and drive to help customers. Customers looking to open a Stocks and Shares ISA can choose between a Do-it-yourself or a Ready-made portfolio: the former allows the account holder to manage their own investments with the choice of more than 2,500 funds, shares and other investments and the latter is a portfolio managed by the provider. The Ready-made ISA requires a minimum investment of £1,000 – double that of Nutmeg. Investors, whether experienced or novice, have many options when it comes to choosing the right ISA account and provider. As the ISA deadline looms, the pressure is on for providers to get the messaging and targeting right. We will be following developments of digital investment platforms in the UK closely. Mapa Research has recently launched a Digital Investment Platforms Monitor looking at providers in the UK. For more information, please get in contact with us today.